An expansive oratorio, The Apostles calls for six soloists, lavish orchestration, and large chorus. Although often overshadowed by The Dream of Gerontius, written shortly before, it contains some of Elgar’s most inspired music, particularly in the dramatic portrayal of Judas and in the exalted, moving finale. 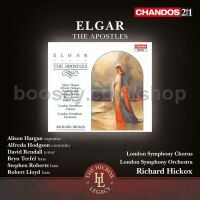 On this ‘241’ release Richard Hickox, a true champion of British music, conducts the London Symphony Orchestra and Chorus. The two most prominent roles, Mary Magdalene and Judas, are sung by Alfreda Hodgson and Robert Lloyd, respectively. The recording also features an outstanding performance from a young Bryn Terfel as Peter. The set is released as part of the Richard Hickox Legacy series.